For those of you who don’t know, the McGees are renting while they design and build their new home. If there's one thing we know about renting, it's that the space still needs to feel like home. One of the easiest ways to make your space feel like home is to have a bedroom that feels cozy, relaxing, and pretty! The best part about bedding is that you can pack it up and move it with ease. Bedding doesn’t have to be a basic bedspread and pillows! Layers, details, and textures bring so much. We've filled McGee & Co. with our bedding favorites, so you can get a collected look that's cohesive but eclectic. Shop now! 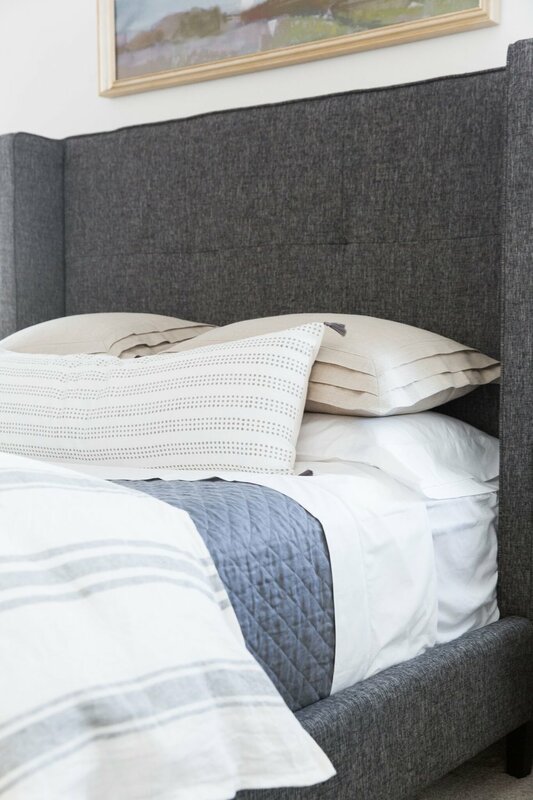 Here are our tips for styling your bed, as shown on Shea's Maxwell Upholstered Bed! Artwork above bed is found here. beautiful shams with pleated details to tie in with the end of the bed. Our favorite way to fold a duvet? Fold it in a half and then pull it back into thirds. (As shown in video) This makes it look extra fluffy and leaves space for a throw, sheets, a quilt, and pillows! If you’re matching shams to duvets but want to keep things from being too matchy-matchy, you don’t have to buy everything in a set. and the prettiest linen duvet cover. Its got heirloom quality, 100% linen, and has a stitching detail with a crochet edge. We topped it off with a thick, natural quilt. Mixing whites and creams might make you nervous, but we say go for it! We get a ton of questions about pillow sizing! For a King bed we recommend doing a 24 inch or 26 inch decorative pillow, while making sure you're also using king sized shams. If you have a queen bed you can use a 22, 24, or 26 inch pillow and don't go smaller than that or it might look tiny on your bed. Even using one larger pillow grounds the bedding and makes a statement! We used the Hartford Block Print Pillow here because it has a beautiful tone-on-tone pattern to complete the monochromatic look. We mixed it up by adding a sheet in the same color but with with a crochet ruffle edge detail. To create even more texture we used a body pillow at the end of the bed instead of a quilt or throw. and added a leather pillow. We've stacked pillows and had them forward facing in this look. There are so many ways to style in bed, but always keep layers, textures, and details. Just have fun with it!